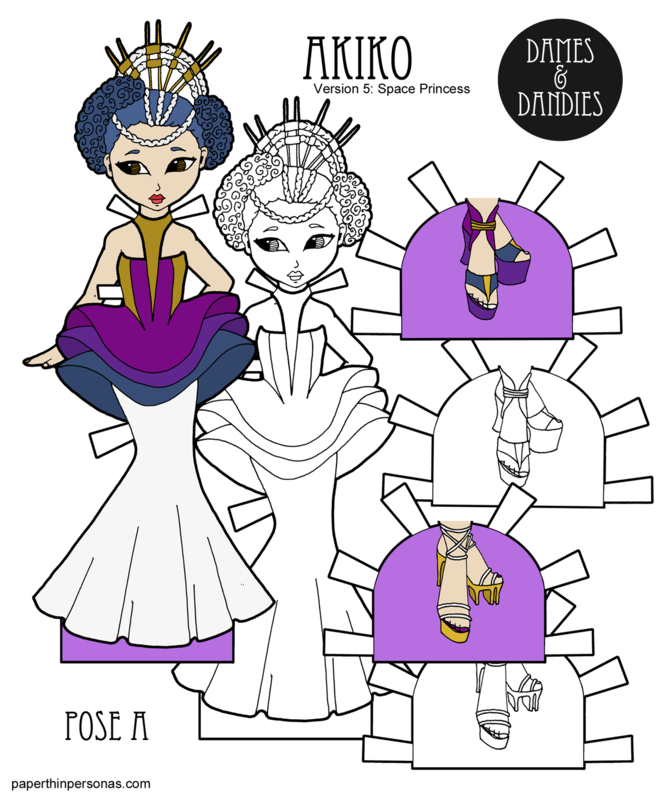 Printable Black & White PDF Printable Color PDF More Paper Dolls & ClothesToday’s new A pose paper doll is Akiko. Like all Japanese names, the meaning of Akiko changes depending on the kanji characters selected to combine to make the name. The “Aki” part of the name can come from kanji meaning “clear, crystal”, “bright” or “autumn” while the “ko” comes from the kanji meaning “child” according to Behind the Name. Someone with more knowledge of Japanese will have to update me if I misunderstand how this works. It’s also the name of one of the princesses of the Imperial House of Japan. Akiko has three pairs of shoes and can wear, of course, any of the clothing for the A Pose paper dolls. I think my favorite of her shoes are her pink sandals. I hope everyone is having a good week. I’m still in recovering from illness mode, so I’ll keep today’s post short. Enjoy the paper doll!